This is the section where a part of the Koromo Plant, Toyota’s first factory in the 10s of the Showa era (1935 – 1945) when the mass production of automobiles started, is reproduced. 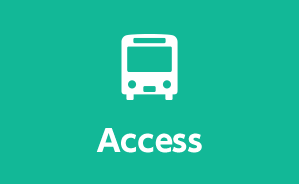 This section will illustrate how the Type AA passenger car was manufactured, along with the production processes of casting, forging, machining, pressing, coating, and assembling. 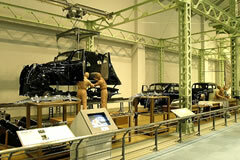 Standing on the floor is a sturdy steel frame, and the dolls resembling factory workers are positioned at each workstation among the machines like heavy masses of iron. A crane dangling a casting mold frame runs on the rail near the ceiling, while workers with tools are fighting against iron. That is what the reproduction eloquently tells you; how things were in those days. A cylinder block for the Type A engine was completed through trial and error at Toyota’s initiation of the business. 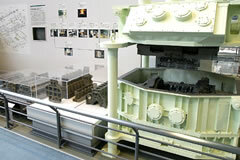 The casting process of the cylinder block is exhibited. The casting method in those days was called “dirt floor casting”, by which molten metal was manually poured from the casting ladle hung from a crane into the molds placed on the dirt floor to create cast metal objects. The forging process of steering knuckles at the Koromo Plant is reproduced. This process depended heavily on manual labor, which required expertise, and was carried out with exquisite synchronicity between the worker who adjusted the raising and lowering of the hammer and the one who supported the hot iron with a pair of tongs. 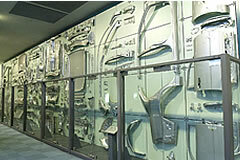 Various forging tools and jig molds are also displayed. 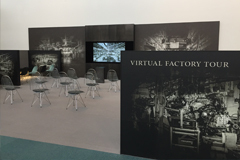 Fifteen various machine tools used at the time are exhibited, including a small-sized lathe, which Toyota developed in-house specifically for automobile parts at the start of the business, a drill press, and imported machine tools. You can see the way machining was done then because you can actually operate the tools if you press the button. 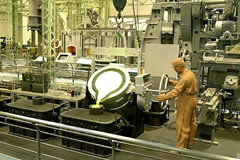 The pressing process in manufacturing fenders for the Type AA passenger car is exhibited. A steel sheet was drawn by a 500-ton press, but all the other processes were done manually using tools like hammers and metal-cutting scissors. 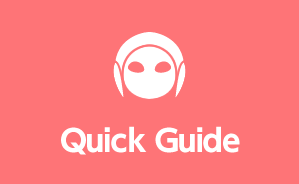 “Finishing coat” means the final layer of painting. 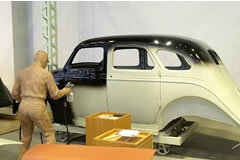 The coating process for the body of the Type AA passenger car is displayed. A spray gun with a cup imported from the U. S. was used at the time. Applying the finishing coat to an automobile body with mostly curved surfaces was a difficult task, so highly skilled expert staff worked at it. The assembly line at the Koromo Plant at the beginning of its operation, along with the conveyor and steel columns used at the time, are exhibited as they were. The Komoro Plant adopted the progressive assembly system, and its mounting, rigging, and coating processes are reproduced. The assembly replied on the manual labor those days, and bolts and nuts were manually braced using wrenches and spanners. As the demand for automobiles rapidly expanded, machines that drastically improved productivity in casting, forging, machining, and pressing, as well as precision and efficiency in processing, were developed and introduced one after another. 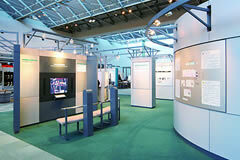 The state-of-the-art production facilities at present are shown in this section. 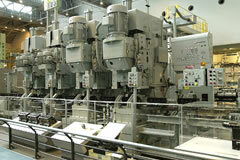 The 600-ton press machine of 11.5 m in height and 235 t in weight stands out among others. 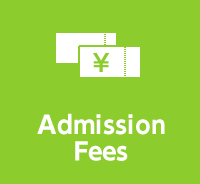 It is the largest exhibition in size in this museum, and the operator-led demonstration of its movement is truly impressive. 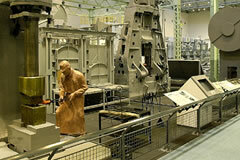 Robots and automatons used in welding, coating, and assembly are displayed as other cutting-edge technologies. Compared with the time when automobiles were manually built one by one at the start of the business, the advancement in technologies is breathtaking. The die fabrication technology vital in press processing is illustrated with the drawing dies for the fenders of several generations of Toyota Crown Victorias. You can clearly see the course of the advancement from hand carving at the initiation of the business, a copy milling machine where the precision in dimensions in curved surfaces and finished dies was greatly improved, an NC (numerically-controlled) copy milling machine, to an NC processing of dies using numeric data. Press processing was employed for most of the figuration of steel plates in the manufacturing of the first generation Toyota Crown in 1955. 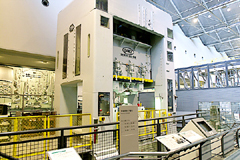 A 600-ton press machine by Danly in the U. S. is exhibited. Installed at Toyota’s Motomachi Plant completed in 1960, this machine was a breakthrough at the time. This press machine dramatically increased the productivity by enabling quick changes of dies and greatly influenced the domestic press machines subsequently produced. 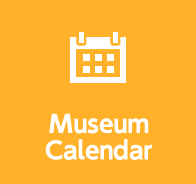 You will feel the awe in crafting when you watch the biggest exhibit in the museum moving. You can see Toyota’s most well-known models that came along with the advancement of motorization in Japan. The first-generation Corolla became the forerunner at the dawn of the “my car” age. The first-generation Camry responded to the needs for safety measures, exhaust emission control, and fuel efficiency. The first-generation Celcior (Lexus) received a high evaluation even abroad because of its high performance and high quality. The percentage of cast parts of all parts is high, and many cast parts are used in the engine, the heart of an automobile in particular. Many defects occurred in the metal casting factory because the molding and pouring technologies were underdeveloped in the beginning; however, many challenges were overcome by sheer effort and creative measures. The evolutionary process in casting technology that played a significant part in improving automobile performance is the subject of discussion here. The technology employed was manual hammering in the beginning in forging, which is a process used for parts that require strength such as gears and axes. Thereafter, die forging with forging press machines became the main technology, and Toyota developed technology to efficiently process forged parts that possessed strength and high precision. 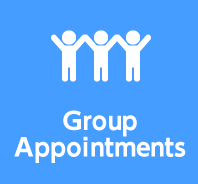 Forging technologies supported mass production and are explained here. 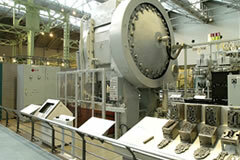 Among the technologies, Toyota’s first 2,500-ton automatic forging press machine, introduced in 1964, is on display and can be operated with a button. Machining is the technology by which products in required shapes and sizes are obtained by cutting metal. 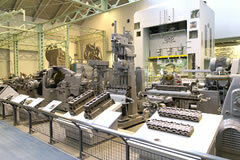 Toyota kept developing machining technology to improve its precision and speed. 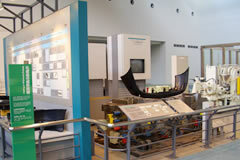 The innovation in machining technologies up to the present-day automation and multiproduct production are shown by displaying a transfer machine (1969), a LeBlond crankshaft milling machine from the U.S. (1964), and a Toyota articulated drilling machine (1996). 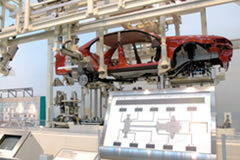 Robots are used for the transportation, assembly and welding of panels. 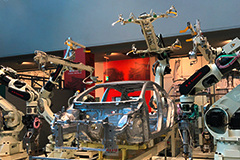 This dynamic exhibition introduces the automatic welding and assembly equipment introduced for the 4th generation Prius. High-quality bodies can now be mass produced by automating robot welding. Body assembly parts produced by welding all pressed parts of the seventh generation Corolla are displayed. Coating is the technology to protect the body of an automobile from the severe natural environment and prevent it from rusting. 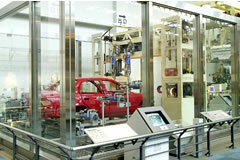 Toyota kept developing this technology to improve mainly the adhesiveness of coating films and surface smoothness. The changes in coating equipment that are deeply related to the advancement in coating technologies and the structure of coating films are explained, as well as automatic finishing coat application equipment that employ electrostatic spraying using the Bell coating apparatus. The assembly in automobiles involves mounting, fastening, and adhesive bonding and consists of fastening of screws, bolts, and nuts for the most part. Everything was fastened manually using tools for assembly in the early days, but as mass production expanded, motive power tools emerged. 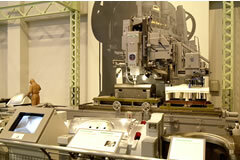 The automation in the assembly has rapidly progressed nowadays with the advancement in electronic control technology. An automatic assembly device that installs engine chassis by moving in coordination with the body on the assembly line and a double arm robot that installs differential gears are displayed. Synthetic chemical products that contain plastics that are easy to process or mold have been highly utilized recently to make the automobile exterior lighter and higher in design. 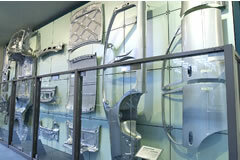 Bumpers and installment panels are on display and one can watch how plastics are molded by an injection molding machine. Ninety-three synthetic chemical products used in the first generation Toyota Celcior (four-door, 1989) are also displayed. The Toyota Production System aims to provide clients only good products in a short time and is based on a combination of two principles: i) “If an error occurred, machines would immediately shut down in order not to continue producing defect products (Automation with Human Element),” and ii) “Supply only the required material in only the required amount to each process and produce in a flowing manner without stagnation (Just-in-Time).” Toyota’s automobile production mechanism, established with the accumulated improvements over the years, are explained in an easy-to-understand manner, using animation videos and experiential apparatus. Watch on a monitor as rolled iron plate goes though the process of being transformed into a car. Who was Kiichiro Toyoda ?